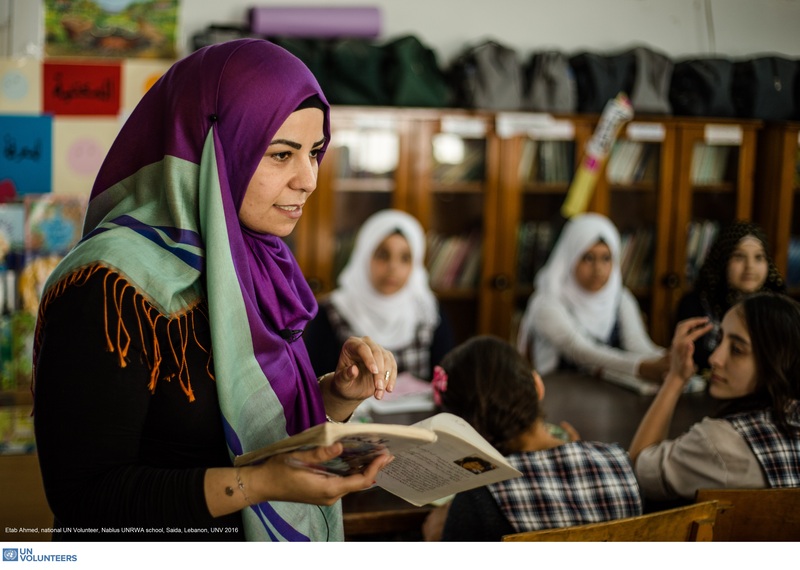 UNRWA Lebanon approached the United Nations Volunteers (UNV) in 2015 seeking a way to recruit teachers to support the learning needs of Palestinian refugee children arriving from Syria — refugees twice-displaced due to conflict in the region. UNRWA wanted to assure that education could be provided to these children to help them recover from the shocks of conflict and to give them future opportunities to succeed in life despite their circumstance. In Lebanon, the United Nations Relief and Works Agency for Palestine Refugees (UNRWA) delivers education services to Palestinian youth who, despite their refugee status, deserve the opportunity to be students. With a network of schools administered from the refugee camps, UNRWA is committed to providing all Palestinian refugee children quality, equitable and inclusive education that is in line with the official Lebanese curriculum so that refugee youth may participate in official exams at the end of the preparatory cycle (Brevet) and secondary cycle (Baccalaureate), giving them a chance to pursue post-secondary education and future employment opportunities despite their precarious environment. The solution brokered by UNV was the recruitment of Palestinian refugees as UN Volunteers, a strategy that both reinforces the skills of Palestinian refugees and answers the needs of their communities in Lebanon. Students and teachers welcomed the additional support provided by UN Volunteers teachers. Their spirit and enthusiasm are helping young Palestine refugees succeed academically and integrate into their new communities. In 2016-2017, a total of 5,251 students out of the 36,088 enrolled in 67 UNRWA schools are Palestinian refugee children recently arrived from Syria. The spirit and practice of volunteerism adds considerably to UNRWA and its services. We look to support Palestine refugees in Lebanon through direct people to people contact – through our service provision and also through the support of volunteers, said Claudio Cordone, Director of UNRWA Affairs in Lebanon. UN Volunteers make important contributions to UN action in the pursuit of sustainable development, with a focus on people in transition or crisis. Volunteers make a difference to the communities where they are assigned by being helping hands as well as being active models of change. Volunteerism is an opportunity for everybody, including marginalized groups, women and youth, to have their voice heard and their actions recognized. “Providing additional teachers was also part of UNRWA’s response to the No Lost Generation of children from Syria and supporting UNRWA’s education in emergencies response. UNV was the appropriate solution at the time – it meant that children from Syria, alongside the Palestine refugee children already in Lebanon, could receive additional support and specific coaching as well as regular classes to support their transition from the Syrian curriculum to the Lebanese curriculum,” outlined Claudio Cordone. Through volunteerism, UNV provided a much-needed solution to the challenge that UNRWA was facing. UNV has also given qualified teachers the chance to give back to the Palestinian refugee community, and provide education to the children of the community (those from Syria and in Lebanon). In addition to encouraging refugees to serve refugees, UNRWA seeks to raise and build the capacity of the Palestinian refugee community through collaboration with partners. In this context, and as embedded within the curricula for secondary schools, students carry out community-service projects in collaboration with partners and NGOs. Similar community-based projects were supported by UNV throughout Summer 2016. For example, with the support UN Volunteers and Health Tutors, mothers in the refugee communities learned about the school curriculum and health and received training on issues of health and hygiene.